As much as we wish it to be so, this fatal viral disease is not a thing of the past. Every few minutes, someone in the world dies from rabies. Learn 10 facts about rabies here. 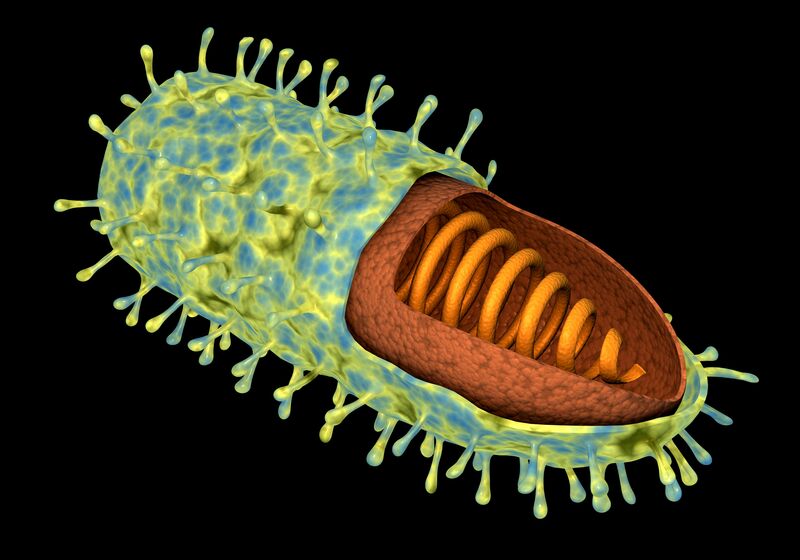 The microscopic shape of this virus is important for two reasons, even if only to serve as a mnemonic (memory aid) about the deadliness of this pathogen. Rabies, with rare exception, is usually fatal. This virus travels from the bite wound location along the peripheral nerves to the brain. The animal does not appear sick during this time, called the incubation period. Once the virus reaches the brain, the animal quickly becomes symptomatic and dies fairly quickly after that, usually within 7 days or less. Bite wounds are the mode of transmission for the vast majority of rabies infections. Once the rabies virus reaches the brain, it also replicates in the salivary glands, making transmission easy and possible. Transmission may occur through other routes too, but this is a much more rare occurrence. According to the Centers for Disease Control (CDC): "Transmission has been rarely documented via other routes such as contamination of mucous membranes (i.e., eyes, nose, mouth), aerosol transmission, and corneal and organ transplantations." The public image of rabies is that of a "wild" or "ferocious" animal, as depicted in the classic movie, Old Yeller. While this manifestation of rabies is possible, many animals appear tame, also known as the "dumb" or "paralytic" form of rabies. This may be even more dangerous, as people attempt to care for animals, especially wildlife, who are tamer-than-usual or appear helpless. Animals found as strays and later found to be rabid, potentially expose many people to this disease. Bats are a common reservoir for rabies in the US. They sneak in homes and are small enough to hide in beds and other common areas in the house, avoiding detection. Other times, a family pet may bring in a sick bat or a person may be bit attempting to get a bat out of the house. Sometimes the person is sleeping, unaware of a bite. According to the CDC, about 6% of bats are rabid. Further, "there are usually only one or two human cases per year. But the most common source of human rabies in the United States is from bats." Caution and "bat-proofing" your home and other buildings ​are recommended. Given that the majority of dogs and cats in the US are vaccinated pets, this is not a surprise. The CDC reports: "More than 90% of all animal rabies cases reported to CDC each year occur in wild animals. The main animals that get rabies include raccoons, bats, skunks, and foxes." The big danger, aside from obviously aggressive wildlife, are baby animals or adults who appear sick, helpless, or tame. Capturing and trying to rescue or rehabilitate them could mean unnecessary exposure to rabies. If you find wildlife that fits these descriptions, it is best to call local animal control authorities to assist. Dogs in developing countries, both wild and those kept as pets, are a large reservoir of rabies and a potential source of human infection. According to the World Health Organization (WHO), dogs "are the source of infection in all of the estimated 50 000 human rabies deaths annually in Asia and Africa." Millions of dogs are killed each year in countries where this is a problem to help stop the spread of rabies. This is often accomplished by cruel and inhumane methods and does little to fix the larger problem of rabies. Cathy King Ph.D. DVM, founder of World Vets, an organization to help both animals and people around the world, initially founded her mission to help these dogs and their people. Post-exposure prophylaxis, or PEP for short, is what happens if you have been bitten by, or exposed to, a rabid animal. Or, in some cases, a suspected rabid animal, if definitive testing is not available. The PEP for rabies is thorough wound care and a 4-dose vaccination schedule as outlined by the CDC. Some cases warrant administration of rabies immunoglobulin. Or, to put it another way, approximately one human death from rabies occurs every 10 minutes. Most deaths are reported from Africa and Asia with almost 50% of the victims being children under the age of 15. Prodromal period: First 1 to 3 days after the rabies virus reaches the brain. Vague neurologic signs that progress rapidly - Some animals may appear ​tame, some will drool more. Death usually follows within 10 days due to paralysis. Excitative stage: Next 2 to 3 days. This is the "furious rabies" stage - tame animals suddenly become vicious, attacking humans and other animals as they roam and wander. Some animals will chew and eat odd objects (rocks, sticks, etc.). Paralysis is setting in, and losing the ability to swallow will cause frothing at the mouth. Paralytic stage: Follows excitative stage, or is the main clinical presentation for some animals. Rabies is diagnosed by examining brain tissue from the deceased patient. There is no way to diagnose rabies definitively before death. There is no cure for rabies. The success of post-exposure protocols varies with the location of the wound, time lapse from exposure to vaccination, and age and general health of the patient. Vaccinating for rabies is the best (and only) way at this time to prevent this deadly disease. Animals (dogs, cats, livestock) and humans who work in high-risk jobs for rabies exposure should be vaccinated for rabies. In the US, laws vary by state and municipality, but rabies vaccination is required by law for dogs and cats.